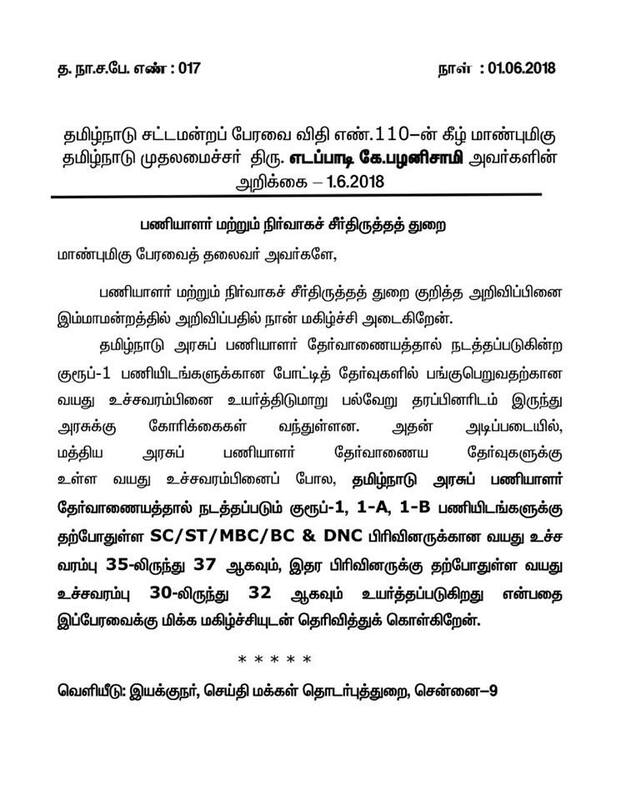 01-06-2018 : On 01-06-2018, the Hon'ble Chief Minister Thiru.Edappadi K Palaniswami has made an announcement in the Tamilnadu Legislative Assembly to increase the maximum year to appear TNPSC Group 1 Exam from 35 years to 37 years for SC,ST,MBC,BC, DNC and 30 years to 32 years for General categories. 25-11-2016 : Increase TNPSC Group 1 Exam Maximum Age Limit to 45 Years - R. Mutharasan, Tamil Nadu State Secretary, Communist Party of India. Stating other states like Keralam, Hariyana, Rajasthan, Gujarat, Bihar and West Bengal, the Communist Party Leader has requested the Tamil Nadu Government to increase the Maximum Age Limit for Group 1 Exam to 45 Years. He also requested the government to extend the last date for applying TNPSC Group 1 2016 to 31st December 2016. 07-11-2016 : TNPSC Group 1 Age Limit Should be increased to 40 years - Anbumani Ramadoss. Quoting other states such as Andhra Pradesh, Gujarat, West Bengal, Assam, Tripura and Haryana which have 40 Years as Maximum Age Limit for Group 1 services, the Pattali Makkal Katchi Leader has requested the Tamilnadu Government to increase the Group 1 Age Limit to 40 Years. A march has been organised by the Group 1 Aspirants Association in Chennai requesting to increase the maximum age limit of TNPSC Group One Examination. 19-07-2015 : TNPSC Group 1 Aspirants requests the government to increase the Group 1 Age Limit to 45 years. The maximum age limit to write Group 1 examinations in Gujarath, Hariyana, West Bengal, Assam and Tripura is 45 years . In Kerala it is 50 years. The association organizers Thenmozhi and Hemanathan informed this to media persons today. 05-01-2015: There is a news in today's Tamil Hindu News Paper about the TNPSC Group 1 Age Limit . The news article quotes the UPSC's age limit increase announcement last year. 08-08-2014: MLA's demand increase in TNPSC Group 1 Age Limit. On 07-08-2014, during policy note discussion in the Tamilnadu legislative assembly, Honourable MLAs of various political parties have demanded increase in the age limit of TNPSC Group 1 Exam from existing 35 years to 45 years for General Candidates and 50 years for Reservation Categories. 20.11.2013: TN Government to consider increasing age limit of TNPSC Group 1 Exam- The Tamil Hindu newspaper dated 20-11-2013 says that the government is seriously discussing about the increase of Group 1 Age Limit in TNPSC Exams. TNPSC Conducts Group 1 Exam for recruiting State Civil Service Officers like Deputy Collector, DSP etc. At present the age limit for TNPSC Group 1 Exam is 35 years. The Tamilnadu Government may increase the TNPSC Group 1 Exam Age Limit to 40 Years or 45 Years. It is expected that the Hon'ble CM may announce the changes soon. On October 11, 2013 a group of TNPSC Aspirants conducted one day fast at Chepauk , Chennai demanding the government of Tamilnadu to increase the age limit to apply TNPSC Group 1 Exam from 35 years to 45 years. The aspirants at the fast told the media that the age limit to apply Group 1 level posts at other states like Gujarat, Kerala, West Bengal, Assam and Tripura is 45 years. Some political party leaders like Tha.Pandiyan (Communist Party of India) also stressed the government of Tamilnadu to consider the aspirants demands. How to prepare for TNPSC Group 1 Exam New Syllabus and Important Books List for TNPSC Group 1 Exam ? Honourable Ministers answer in the TN Assembly about the increase of TNPSC Group 1 Age Limit. From 35 to 45 ?